Another revisit years in the making brings us back to Kent’s version of a locally owned and operated Chipotle, transmogrified two stops toward hippiefied grains and tree bark and away from streamlined corporate franchise. Perfect for a college town. They offer more options than the last time we were there. Nearly any personal preference or choice in cuisine can be accommodated, and often in multiple forms. The tortilla chips are clearly and strangely (for a place that seems to list the source of most of it’s ingredients) bought from some random big box store. 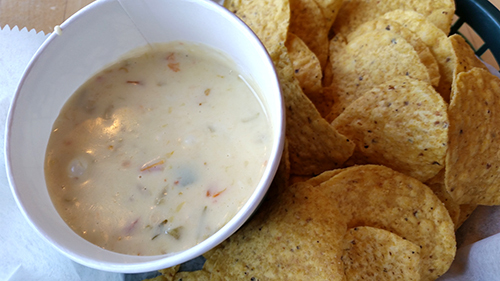 The Queso dip seems to be all cheese, no filler, and bits of veggies. Blanco and salty, the dip seems to thicken significantly with every degree of temp it looses. 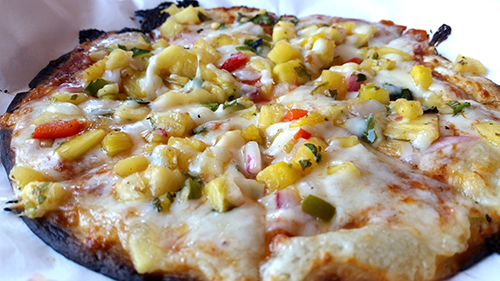 A little tortilla pizza with pineapple salsa isn’t bad with sweet fruit and bits of savory veg. One reason the place smacks of the national chain or vice/versa is their tacos and burritos are thick. 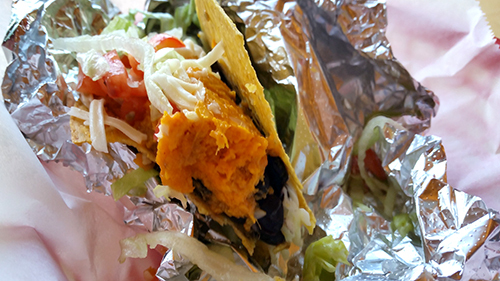 I despised the sweet potato and black bean taco (a little back story…I HATE almost everything sweet potato; I was wondering if they have some secret spicy addition that would make me like the damned orange tubers. Nope.) but Steph didn’t care much for it either and she’s less biased. She had a chicken and rice with sour cream (the sour creams is vegan BTW, made with nuts but still creamy and tangy), which was actually pretty bland until you added some of their hot (not mild) sauce. Then it came to life. 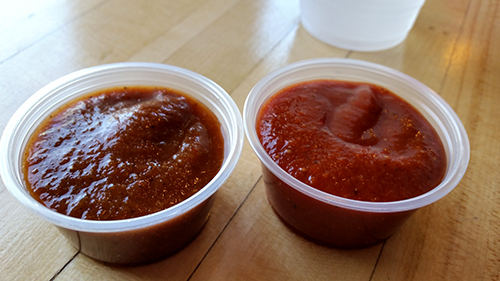 The mild sauce was fine but the hot had all sorts of awesome and wasn’t hot enough to make you regret loading it on. 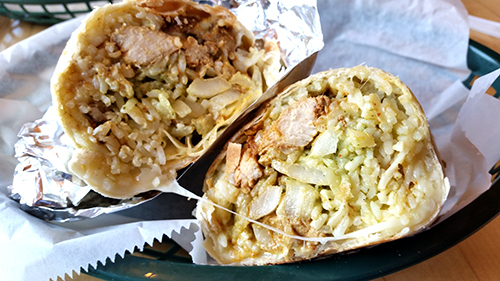 I tried their special, Sujan’s Spicy Tandoori Chicken Burrito, with spicy marinated and grilled tandoori chicken topped with rice, cheese, onion, jalapeno and a cilantro yogurt sauce. The marinade lent a green hue and rich spicy punch. Pickled peppers, tangy yogurt, etc., tasty enough to wrap up and eat cold later on. 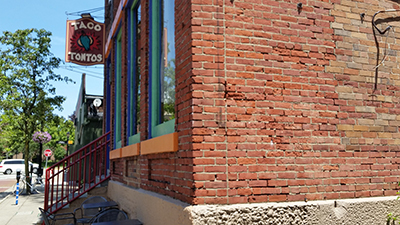 Taco Tontos fits where it sits and while not everything is as tasty as it might be earth friendly some of it is delicious. Still exploring the Kent Ohio lunch options every other weekend we had our sights set on Cajun Dave’s at the Water Street Tavern but quickly discovered their hours were not the same as they claim on the website…oh well. 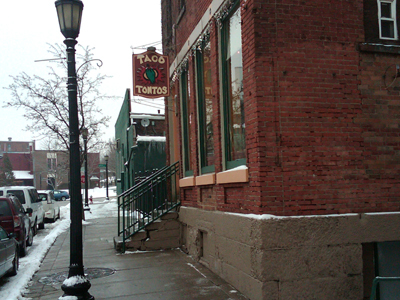 There are a bunch of interesting options downtown and we decided to try Taco Tonto’s which is right next to Ray’s Place. Once you make it up the dodgy steps (very carefully if it happens to be snowy) you enter an odd mix of pure function and whimsy. 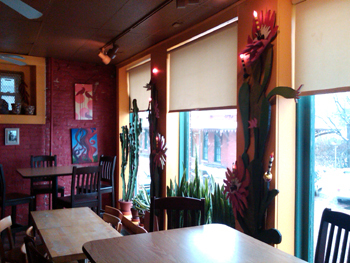 Wildly colored walls and decorations surround very few shaky seats and tables. Several people appear to be living on the takeout option. The line of demarcation is the counter which conceals the majority of the kitchen. From this line back, everything has a very bohemian/industrial feel to it. I know…two things that should be antithetical but once you are inside it does have both vibes. The kitchen was staffed by two dudes who I am willing to bet aren’t far from fraternity row. Service is from the counter and is brash but in a friendly sort of way. Actually having a couple of guys rockin to Ringo and intelligently debating post-Beatles Beatles music is entertaining. I just hope they got more out of their education than an appreciation of classic rock. The menu is tacked to the wall amongst a number of eco-friendly suggestions. 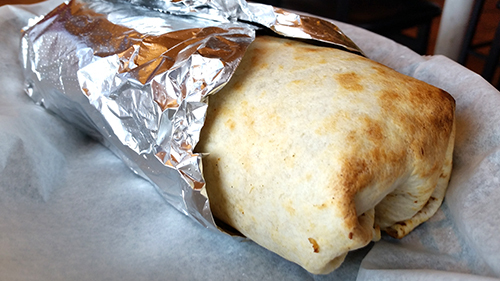 Everything is served in foil and paper. This is a little worrisome. It is often difficult to tell if a place is actually interested in being green or making green. I can’t be the only one who has ever wondered standing in a hotel room with a towel; if the manager of the property is trying to conserve water or is only interested in conserving on the water bill and labor. Hence the worry. Are they cutting every corner possible when it comes to the food too? Standing in a taco place with the current allegations about the amount of beef at the bell makes you wonder about things. We ordered a single of the salsa and chips, a chicken burrito which comes with rice and sour cream, and two tacos. The first taco was the combo of beef and beans on a hard corn tortilla. You have an option of pinto or black beans, we went with black. The other taco was something I have only had at Taco Tonto’s, the potato and sour cream wrapped in a soft flour tortilla. 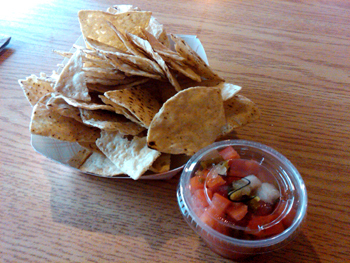 The chips were fine and the salsa was super simplistic but fresh and filled with chunks of tomato, onion, jalapeno, etc. 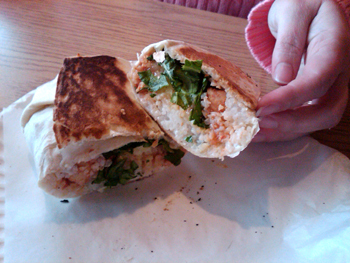 The burrito was the same thing…fresh ingredients…just a few…but in a really good combination. Steph remarked and I agreed that the greens on all three offerings really added something to the overall flavor. Rather than the white-green, fast-food, devoid of any flavor shredded lettuce; Taco Tonto’s uses a dark green which adds a bite of bitterness and a little more in the way of texture. White rice, sour cream, dark greens, grilled chicken. Not that much to it but the whole mass was really tasty. 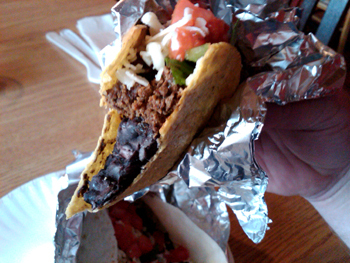 The combo taco had this sort of insane bean paste spackled into the bottom of the shell. Atop the beans were beef and another spattering of the same fresh ingredients found everywhere else. The potato taco had inch cubes of steamed potato and sour cream. I topped both with both of the house hot and mild sauces which didn’t really seem to add all that much to the dish. The mild had an odd sweetness to it and the tang of something similar to tamarind. The hot wasn’t really hot enough to stand up to the huge chunks of potato or the bean paste. 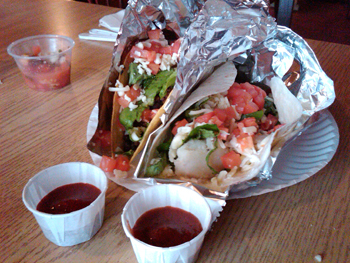 In two words Taco Tonto’s is simple and fresh. A welcome refuge from over processed drive-thrus. 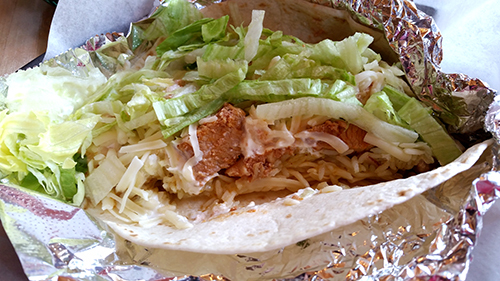 If you are in the area and are thinking Mexican…its worth the wait to have a dude make it fresh at Taco Tanto's.